Written in red paint, the symbols may help Egyptologists figure out why mysterious shafts were built into the pyramids. The images revealed hieroglyphs written in red paint that have not been seen by human eyes since the construction of the pyramid. The pictures also unveiled new details about two puzzling copper pins embedded in one of the so called "secret doors." 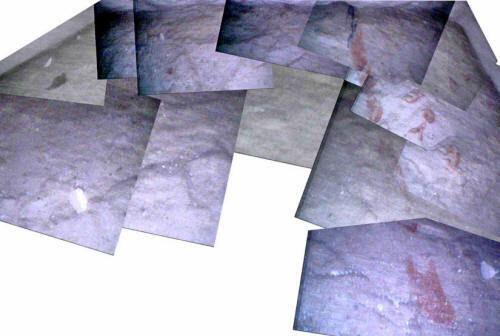 A composite of images of the floor of the Great Pyramid is shown. "We believe that if these hieroglyphs could be deciphered they could help Egyptologists work out why these mysterious shafts were built," Rob Richardson, the engineer who designed the robot at the University of Leeds, said. The study was sponsored by Mehdi Tayoubi and Richard Breitner of project partners Dassault Systèmes in France. Archaeologists have long puzzled over the purpose of four narrow shafts deep inside the pyramid since they were first discovered in 1872. Two shafts, extend from the upper, or "Kings Chamber" exit into open air. Nine years later, Hawass explored the southern shaft on live television. As the world held its breath, a tomb-raiding robot pushed a camera through a hole drilled in the copper pinned door - only to reveal what appeared to be another door. 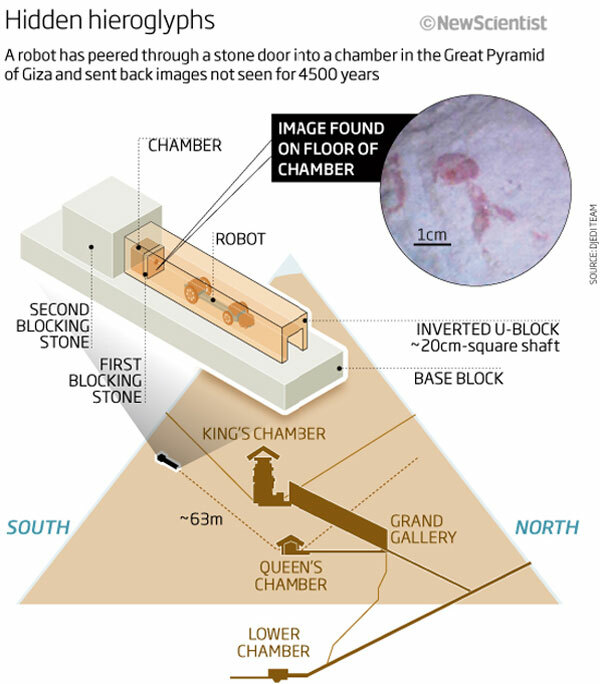 The following day, Hawass sent the robot through the northern shaft. After crawling for 213 feet and navigating several sharp bends, the robot came to an abrupt halt in front of another limestone slab. "I dedicated my whole life to study the secrets of the Great Pyramid. My goal is to finally find out what’s behind these secret doors," Zahi Hawass, Egypt's Minister of State for Antiquities Affairs, told Discovery News in a recent interview. The project began with the exploration of the southern shaft, which ends at the so called "Gantenbrink’s door." The robot was able to climb inside the walls of the shaft while carrying a "micro snake" camera that can see around corners. Unlike previous expeditions, in which camera images were only taken looking straight ahead, the bendy camera was small enough to fit through a small hole in a stone "door," giving researchers a clear view into the chamber beyond. 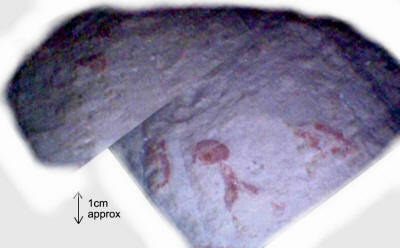 It was at that time that the camera sent back images of 4,500-year-old markings. 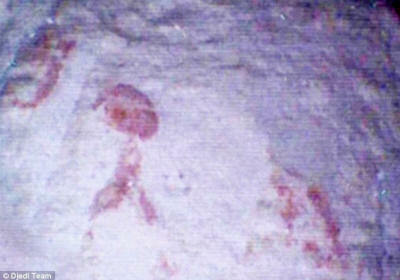 "There are many unanswered questions that these images raise," Richardson told Discovery News. "Why is there writing in this space? What does the writing say? There appears to be a masonry cutting mark next to the figures: why was it not cut along this line?" Roberston wondered. The team has committed to completing the work by the end of 2011. A detailed report on the findings is expected to be published in early 2012.